Week 40 has come and gone and we’re getting very close to TC18 where many of us will get together for #MakeoverMonday live. If you haven’t yet, add it to your session builder to reserve your seat. We’re very excited to see you all and meet many new people. 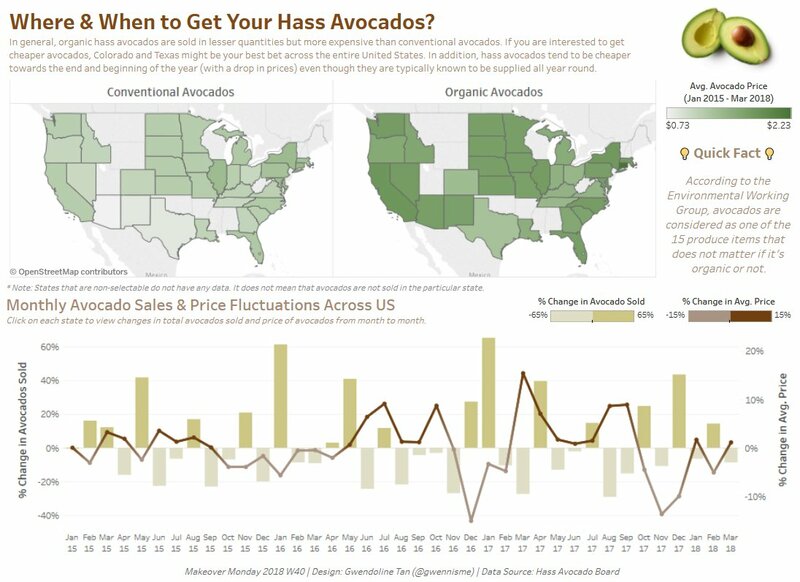 For this week’s Makeover Monday challenge, we asked you do improve on a chart published on the Overridge Wealth Advisors website and based on data from the Hass Avocado Board. 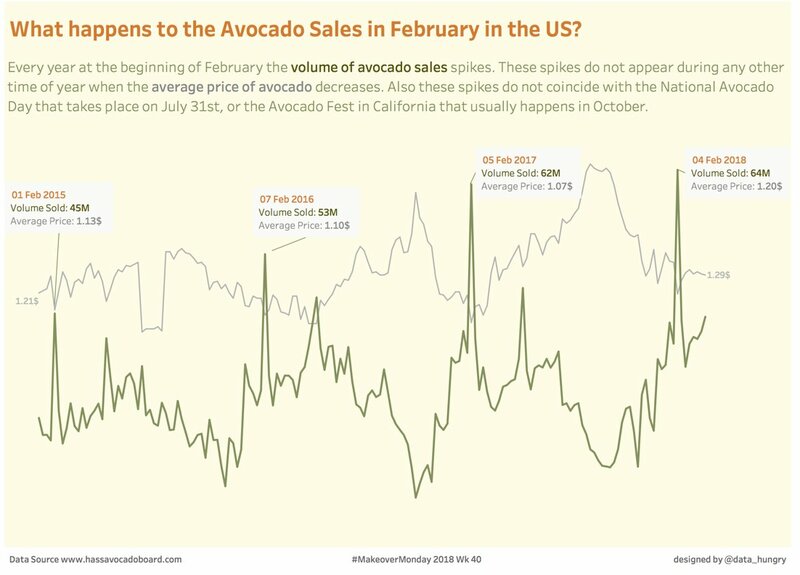 People really embraced the topic and my guess is, you all love avocados just as much as I do! Intro: we’ll do an intro, highlight any news, upcoming events, etc. Review: then we’ll spend 60min reviewing people’s submissions. During this review you’ll get our overall impression and we’ll comment on colors, layout, design, potential mistakes (e.g. aggregations, wording, etc.) and give you our view on how it all flows. I understand that it’s a potentially scary or intimidating thing to submit your work to be reviewed on a webinar with 50-100 people dialled in. We aim to be as constructive as we possibly can in our critique because our goal is to help you improve your skills, learn something each time and find inspiration in the work of others. In the interest of time (we typically have 30-40 submissions for review and it’s almost impossible do go through them all), we are very much straight to the point. That’s out of necessity and while we’d love to spend more time on these reviews, we simply can’t fit more into our day. If you’re unsure, just join a review session without submitting something. You’ll be able to learn a lot simply by listening to and watching what we have to say about the work of others. 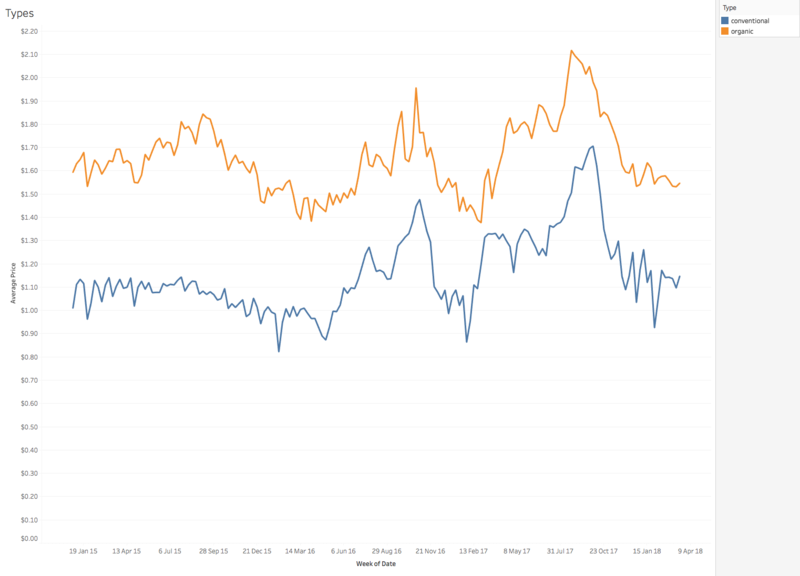 Our feedback also tends to be pretty similar for the same chart types. 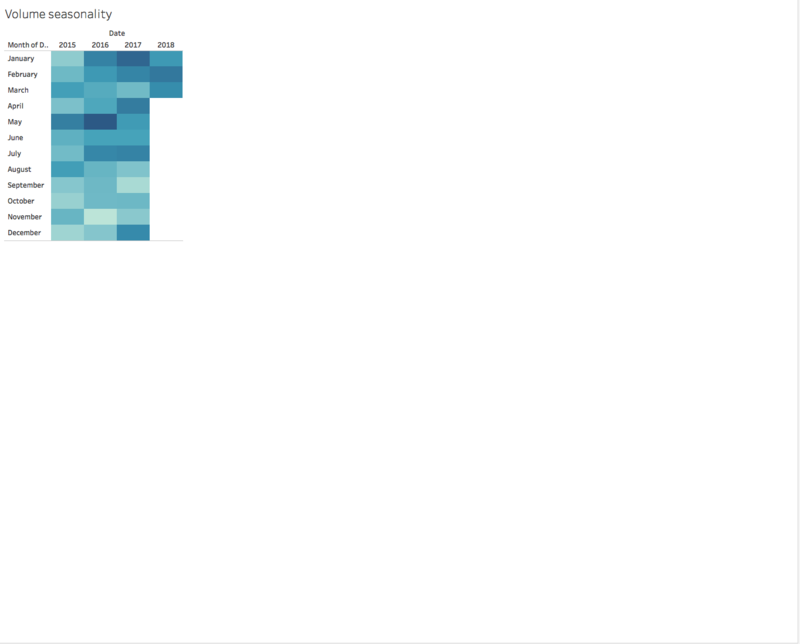 Live Demo: For the remaining 10-15min, Andy or I will do a live demo in Tableau. 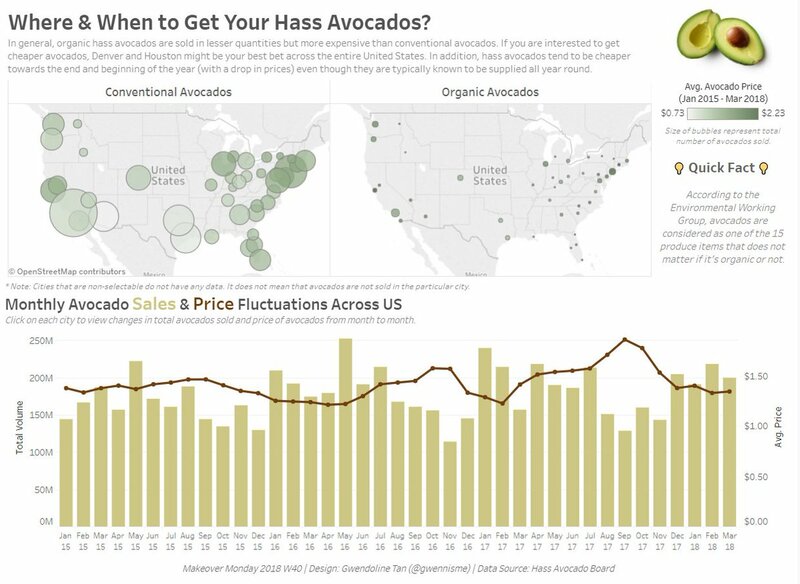 Last Wednesday Andy showed how quickly you can create a well-formatted, simple dashboard from this week’s dataset and that visualizations don’t need to be complicated. I want to highlight a couple of before and after examples from this week’s Viz Review. Thanks to the authors for taking the time to implement our feedback. The dataset contained regions. 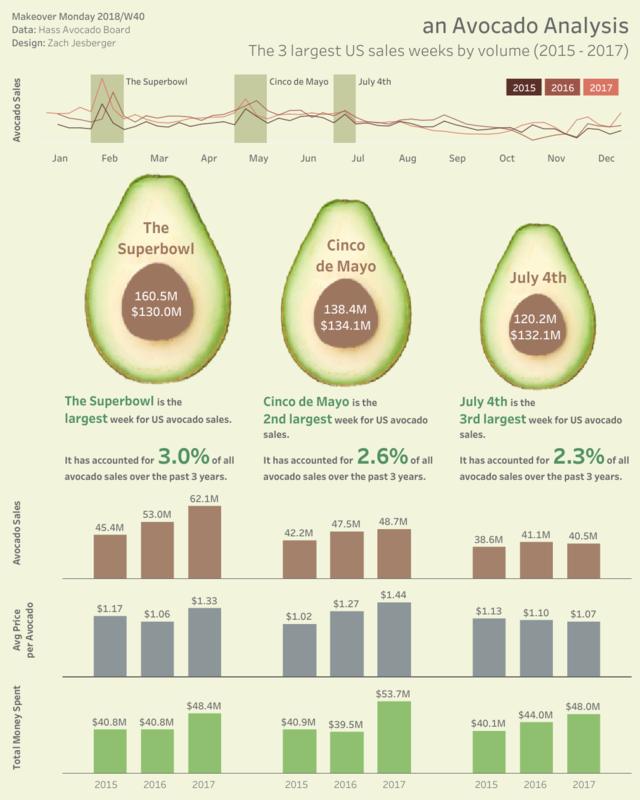 These are what the Hass Avocado Board describes as ‘markets’ and they include cities as well as larger areas. The data also contained a region called ‘total US’. 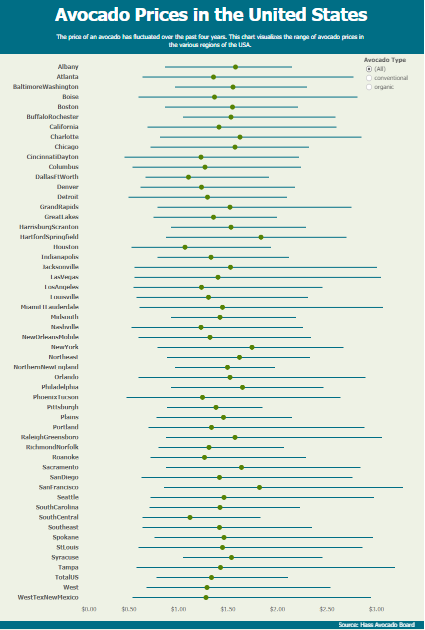 Rather than making the assumption that all regions are of the same level (e.g. 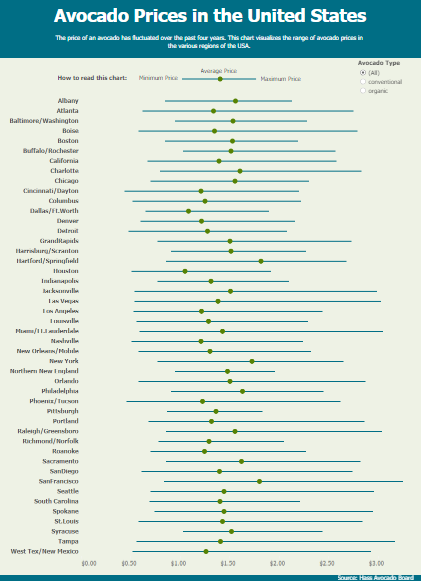 city, state, country), it is important to check during analysis what the regions include. 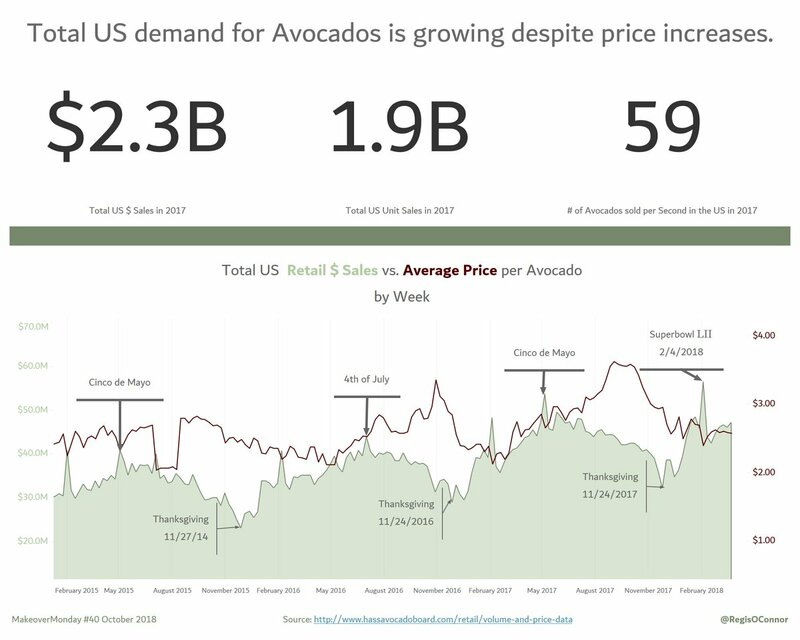 A very simple way to do this is a line chart showing avocado retail volumes over time. One of these regions is not like the other… The region that stands out clearly by being so much larger than all others is the ‘Total US’ region which includes all other regions. So if you look at the actual cities and regions, you should remove the Total US region from your view to avoid double counting. 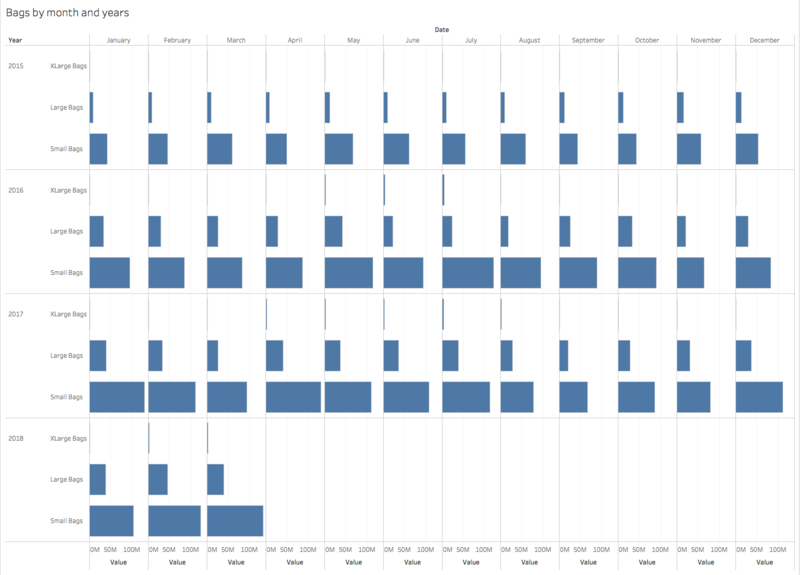 My approach to familiarising myself with a dataset includes checking out the various dimensions and their attributes. 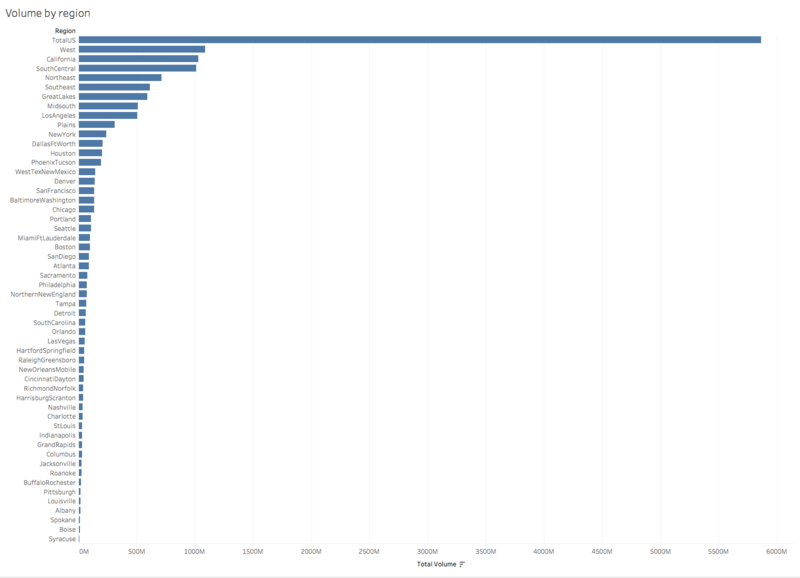 Whether it’s in a bar chart, sorted by a certain measure, or a line chart showing trends over time, or a simple list showing all dimensions members, aim to get familiar with your data so that your analysis is correct and your insights are valid. 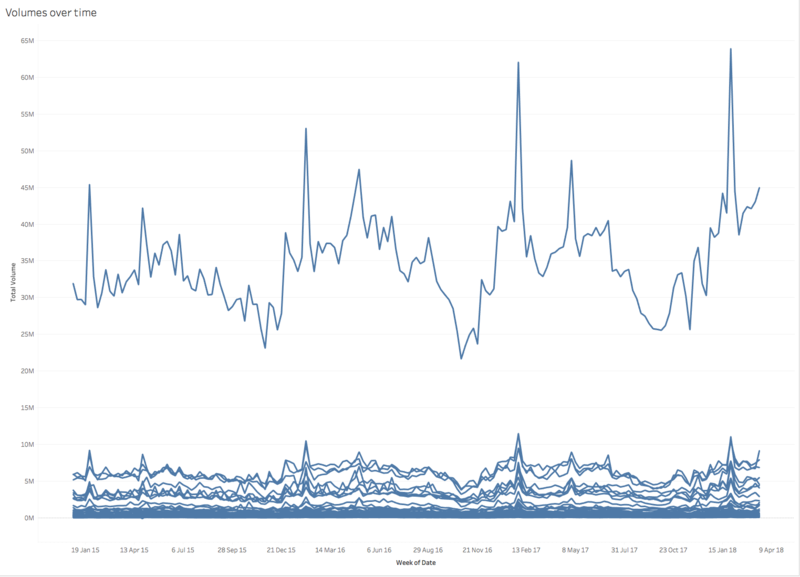 Here is a selection of six charts that can help understand the dataset better. There are many more you can build, but don’t shy away from doing this ground work to form the basis of your analysis. 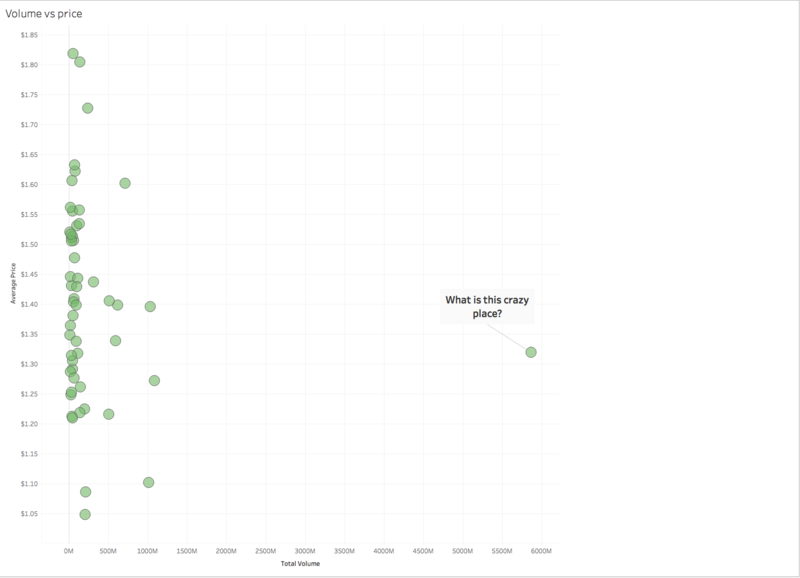 With the topic we expected lots of green and brown vizzes. Using colors that connect with the topic is absolutely fine (see also Chapter 9 in our book). 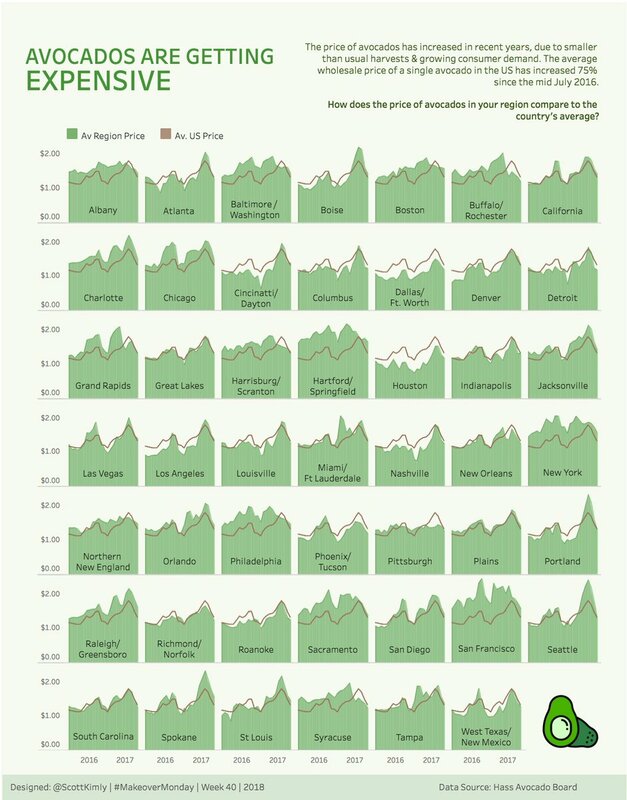 I want to encourage you, though, to ensure your viz is still easy to read. 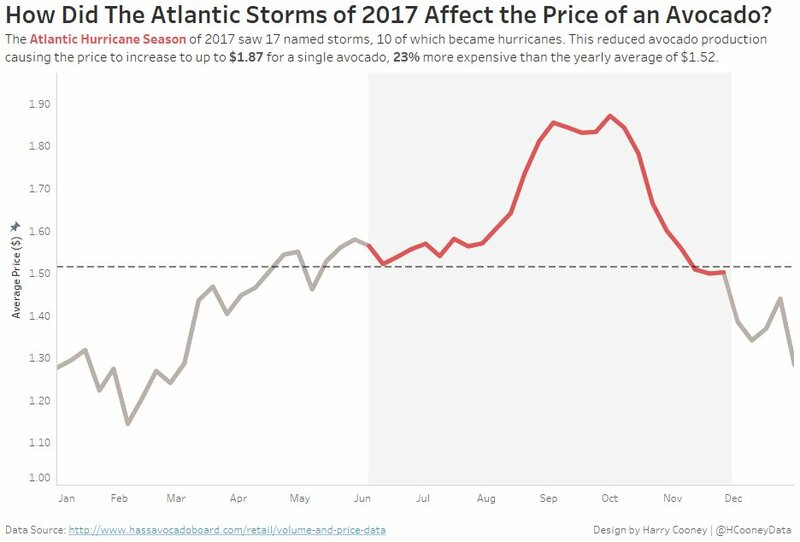 When you use background colors and colors for your data points, ensure there is contrast. 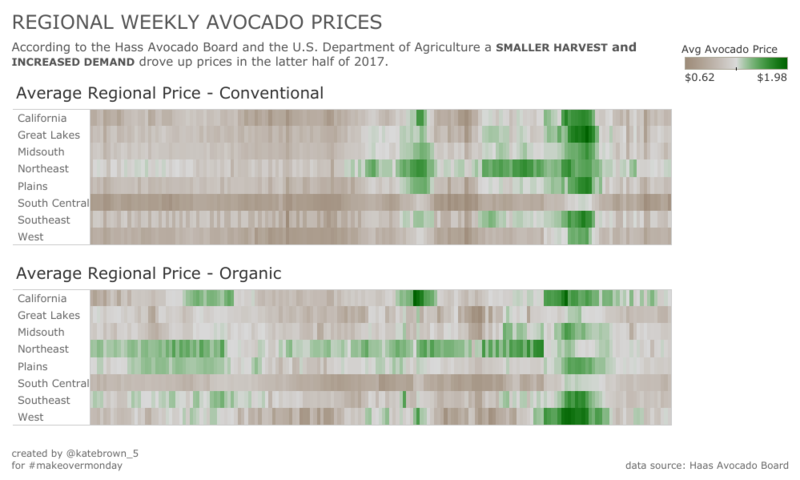 If there is a lot of green in your viz, maybe even a green background, please avoid using red and orange for lines, bars, etc. Green and red in combination can make life very difficult for your audience if they have color blindness. Aim for strong contrast, e.g. grey and black, light grey and purple, light green and black, dark brown and light green, etc. Make sure that even if someone can’t perceive the color itself, they can differentiate between your different lines and dots by contrast if there are no labels. So in summary: avoid red on green or green on red at all costs. Let’s look at this week’s favourites now.